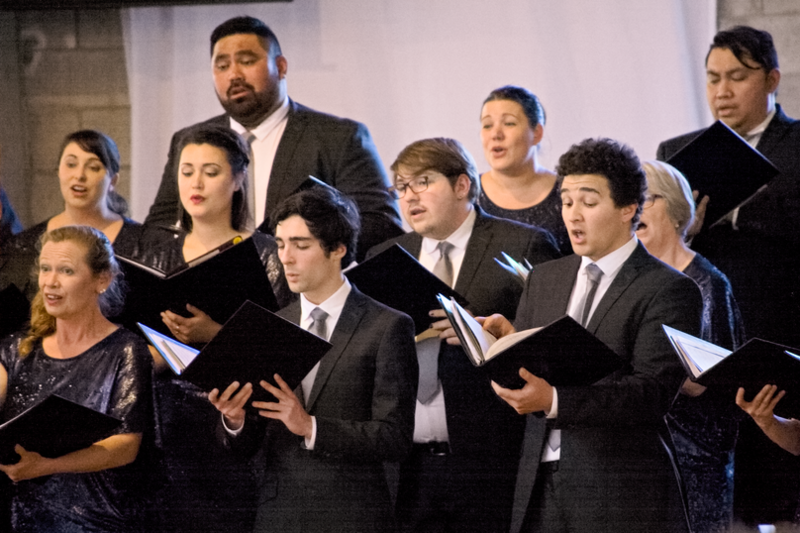 On the 12th May, the Graduate Choir NZ will celebrate Mother's Day with a concert of high quality, featuring Vaughan Williams' Five Mystical Songs as the main item, at St Benedict's Church, Newton. There will be choral music celebrating mothers from Faure and Mendelssohn, to The Platter's Only You (And You Alone), to the latest music from world renowned composer and member of the choir, Chris Artley. Tickets on sale NOW! To buy, click the iticket link. To mark the very generous donation of the Rodgers ‘Infinity’ organ by Old Collegian Michael Flanagan (Peart, 1951-55), King’s College presented a Grand Opening Organ Concert in the school's Great Hall, and The Graduate Choir NZ was an integral part of it. 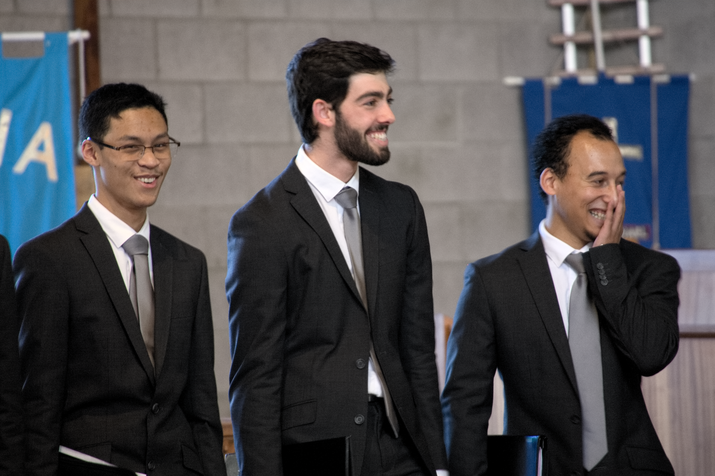 There were performances by two of New Zealand's finest organists, Paul Chan (King's College Organist) and Michael Bell (King's School Organist), on their own as well as with the choirs of King's College and the Graduate Choir. The programme included a wide range of organ and choral works from the last 300 years, including pieces by King’s College’s and The Graduate Choir's internationally-renowned composer, Chris Artley. We had an amazing day on Waiheke Island on the 20th October 2018. This tour was great for the choir to spend time together, and build on the family feeling in the choir. After performing in Morra Hall, which provided a great acoustic for our sound, we toured the island, stopping at Onetangi Beach for an ice cream, and for some choristers a swim! Then the choir was treated to an excellent buffet dinner at the Waiheke Bowling Club, with lots of laughter and more chances for choristers to get to know one another. Overall a wonderful occasion for the choir. This was a well-received sellout concert with music that got toes tapping and the audience smiling. We were joined by talented musicians Chris Artley - piano, Jonny White - drums and Jo Shum - bass. 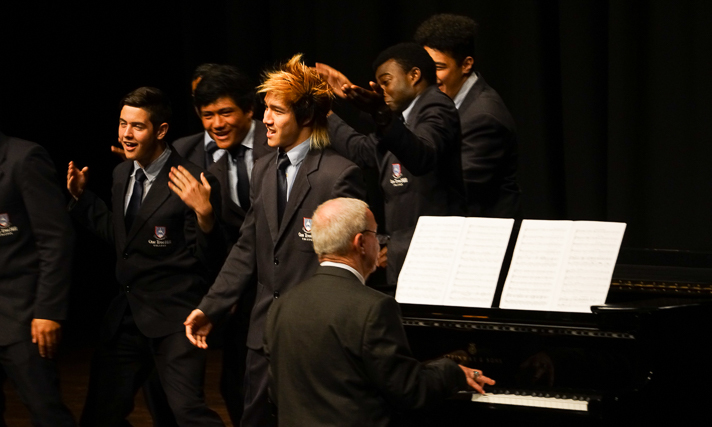 As well, the celebrated boys' choir from One Tree Hill College - The Chorale - were our featured guest artist, performing Only You alongside the grads to great effect. With the centerpiece of the concert being Bob Chilcott's wonderful Little Jazz Mass, other repertoire included music by Porter, Gershwin, Bernstein, Artley, Billy Joel and a host of fabulous arrangements by the likes of Mac Huff and Jay Althouse. This concert really demonstrated the wide variety of repertoire the Graduate Choir can perform. 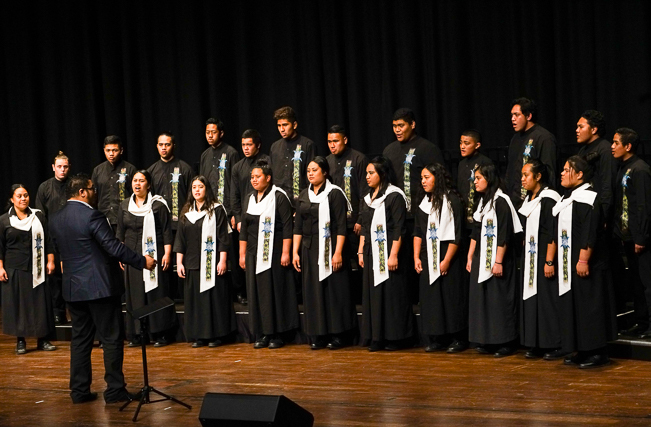 In 2013 The Graduate Choir NZ presented a recital at St Benedict’s called “Ave Maria” celebrating music written in honour of the Blessed Virgin Mary. This performance to a capacity audience received high commendation and, over the years, there were requests for another one. We were delighted, therefore, five years after the first one, to present a further “Ave Maria” recital in St Benedict’s on Thursday 31 May 2018 – which happens to be the Feast of the Visitation. This concert was recorded for production of a fourth album in our discography. The programme featured some of the most popular music from the earlier recital, including works by Lauridsen, Artley, Parsons, Poulenc and Howells. It also expanded with new repertoire that included music by Palestrina, Tavener, Stanford, Górecki and Stopford – all covering a wide range of the repertory from the Renaissance through to very recent compositions. Thank you to everyone who came along to enjoy our Ave Maria concert, it was wonderful to share that glorious music with so many of you. 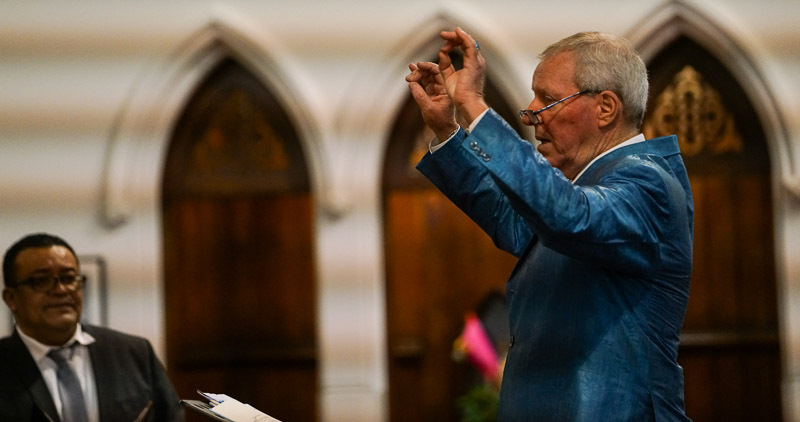 Holy Trinity Cathedral resounded to the exciting sounds of organ, orchestral and choral music on Saturday 10th March when Chris Artley’s new composition – Missa Brevis – received its première. The 25-minute piece, performed by The Graduate Choir NZ (augmented by singers from Holy Trinity Cathedral Choir), Philip Smith (organ) and the Auckland Symphony Orchestra conducted by Peter Thomas, was a result of a commission from the ASO and demonstrated all the hallmarks of the fine, idiomatic, colourful and sensitive writing we have come to enjoy from Chris Artley – all sitting so very comfortably upon the ear of the listener. We were taken from reflective moments to energetic and exciting tutti – the feeling of jazz never being far from the senses. A rare standing ovation from the large and enthusiastic audience for the composer (and stunning new work) was entirely deserved and apposite. The Graduate Choir NZ was privileged to take part in this event and presented four solo items in the first half of the concert: Grieg’s Ave Maris Stella, a new composition by David Hamilton written in memory of the late Peter Godfrey – God be in my head, a hypnotic-like Ave Regina Caelorum by young UK composer Philip Stopford and finally the Magnificat and Gloria (Collegium Regale) by Herbert Howells with Philip Smith at the new Nicholson organ. The choir was especially proud on this occasion since Chris Artley has been a member of the choir, singing baritone and accompanying at the piano, since 2009. We have been privileged to premier and/or perform several compositions by Chris over the years – and the choir always enjoys the idiomatic accessibility of the writing for voices that Chris so expertly provides time after time. 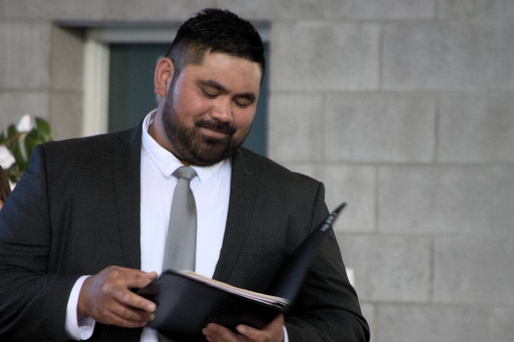 Be sure to catch more of Chris’s pieces performed by The Graduate Choir NZ: 31st May, St Benedict’s – AVE MARIA and CELEBRATE CHRISTMAS with the APO in Holy Trinity Cathedral 14th & 15th December. David Squire, Music Director NZ Youth Choir: "... it was a great afternoon, and we had lots of compliments for both choirs." Terence Maskell: "Great afternoon all-round, lots of good fellowship/bonding, renewing acquaintances/friends – not to mention, of course, the wonderful singing. As I said at the time, I truly felt privileged, both personally and also on behalf of my singers, to be part of the occasion. With over 80 of the country’s best singers producing such a fine sound, and with the bonus of a couple of compositions from Grads singers performed by NZYC, it won’t be forgotten easily! Our singers were most encouraged and impressed – and a huge thank you to you and your team for inviting us to be part of the event." A wonderful concert enjoyed by all who attended. 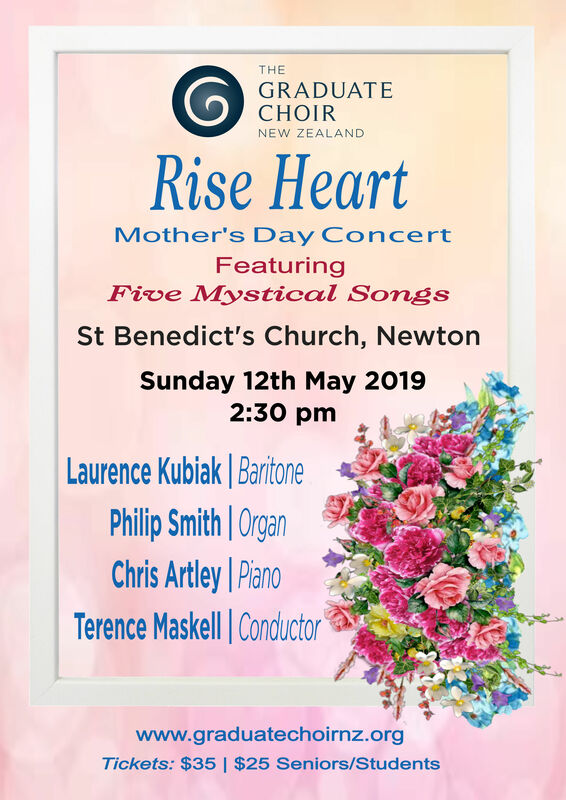 Having become now something of a tradition, the Graduate Choir NZ presented its biennial recital for Mother's Day - A Mother as Lovely as You - on Sunday 14 May in the beautiful acoustics of St Benedict's Church, Newton. The programme was deliberately chosen to appeal to a wide variety of tastes and with a notable nod in the direction of mothers and motherhood. The choir was in peak condition - delighting the audience with French Impressionism, German Romanticism and contemporary music from the likes of Whitacre, Patriquin and Artley - with piano accompaniments beautifully provided by choir member Chris Artley. The changes were rung as the choir moved seamlessly from thrilling polychoral music into SA only and TB only arrangements - providing the audience with a rich variety of choral combinations. As is our custom, a spot prize of a bouquet of flowers was presented to a mother - with the choir serenading appropriately with a Mother as Lovely as You. On Saturday 22 April, The Graduate Choir NZ joined the choir of Holy Trinity Cathedral for a Great War Commemorative Concert in the Cathedral. The first half of the recital showcased not only the two choirs in solo items that featured (from The Graduate Choir NZ) David Hamilton’s In Flanders Fields and choir member Chris Artley’s Dawn, but also combined items with music by Guest, Ireland and Fauré. The second half of the concert was devoted to a new work in seven movements by New Zealander Janet Jennings – ANZACS – A Generation lost in Legend, receiving its NZ première. Conductor Terence Maskell directed the combined choirs and a team of top instrumentalists – the Auckland Brass Quintet, violinist Joe Harrop, organist Michael Stoddart and percussionist Eric Renick, together with a wonderful line-up of young singers – Anna Mahon (soprano), Manase Latu (tenor) and Jonathan Eyers (baritone). This effective composition, based on fragments of poetry written at the time that Jennings herself sourced, left scarcely a dry eye in the Cathedral – such was the emotional impact the dramatic music had on its listeners. 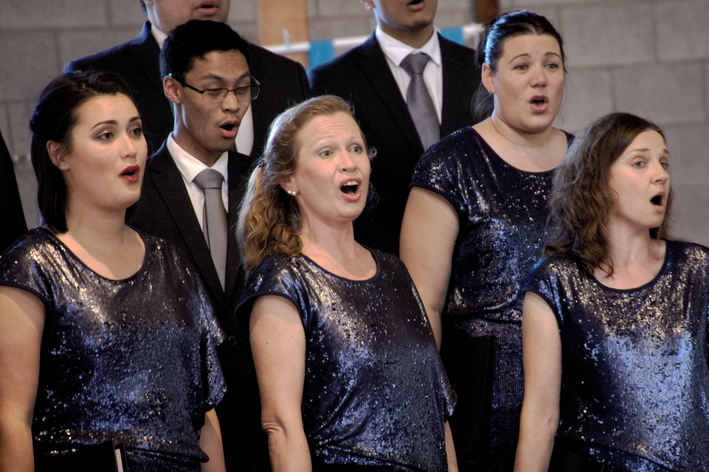 The Graduate Choir NZ performed 2 concerts in December with the APO at the Holy Trinity Cathedral. 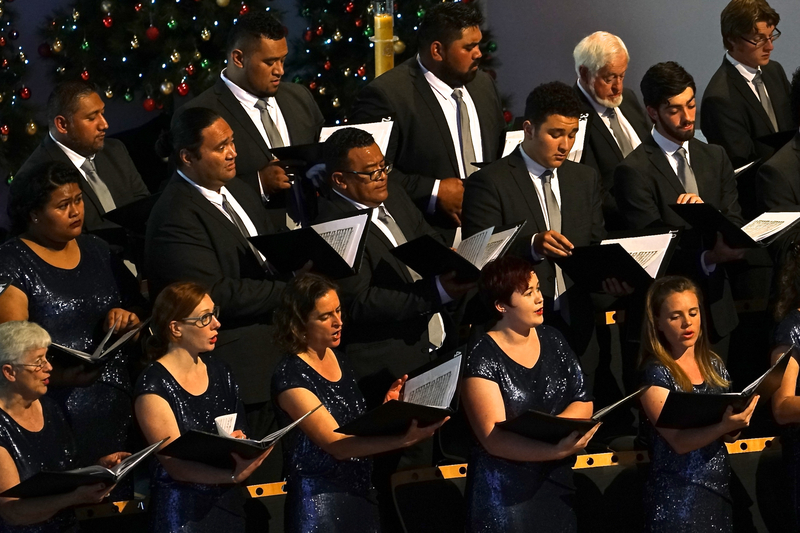 This festive season collaboration of The Graduate Choir NZ joining the APO has become a treasured tradition, and is always a delightful and joyous celebration of Christmas music. 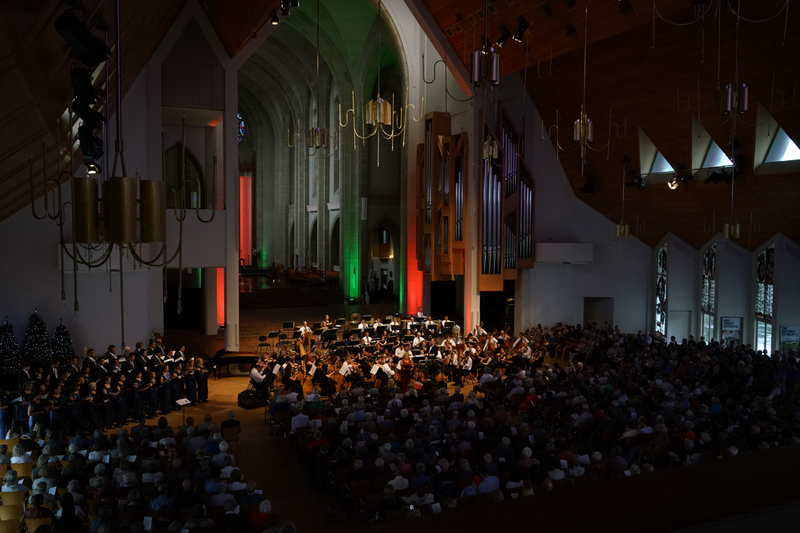 The 2016 concert in December was once again enjoyed immensely by both the audiences and the performers with a particularly beautiful candlelit Silent Night closing the concert. 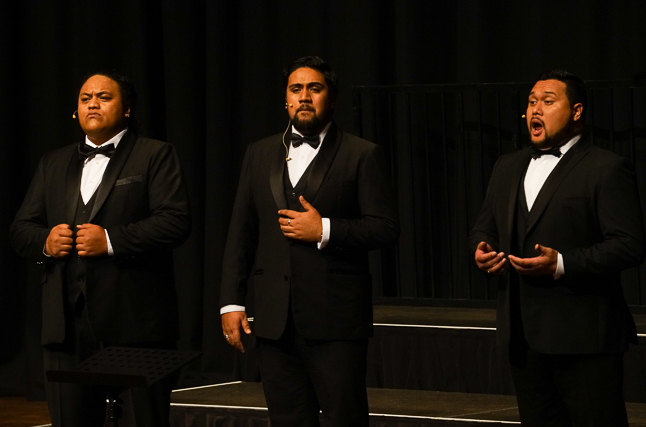 This special concert presented by The Graduate Choir NZ was held on 3rd September 2016 with guest artists; Operanesia, AOtotune (Aorere College Chorale), and the One Tree Hill College Chorale. 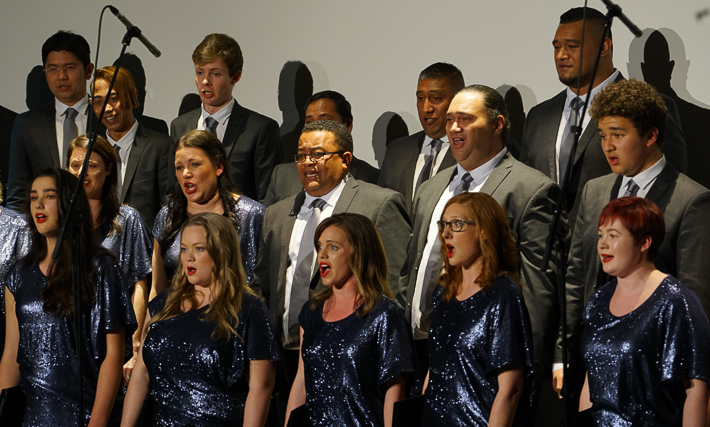 The finale of the programme was the rich and beautiful sound of all voices with "We Are Samoa". The guest artists who were invited to take part in this concert have strong links with South Auckland and The Graduate Choir NZ. 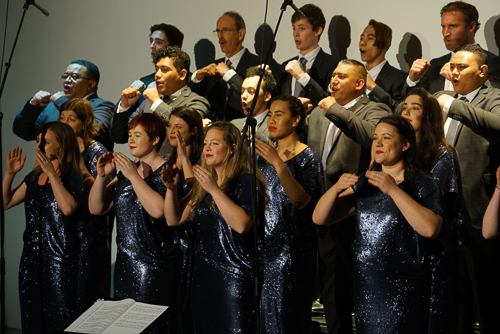 A wide range of choral music that was performed highlighted the young talent in South Auckland, and made for an unforgettable evening of magnificent choral music. 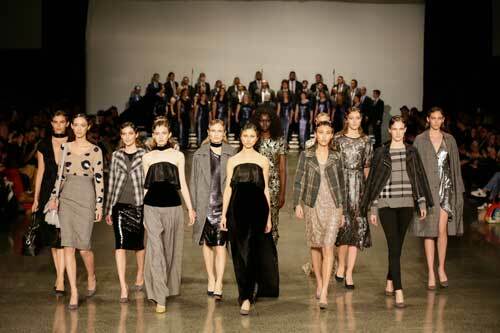 The Graduate Choir NZ was invited to take part in the Hailwood Fashion Show at NZ Fashion Week 2016 as a collaboration with Adrian Halewood, one of New Zealand's top fashion designers. This event was also the launch of the choir's new performance uniform designed by Hailwood, after 15 years wearing the original uniform. 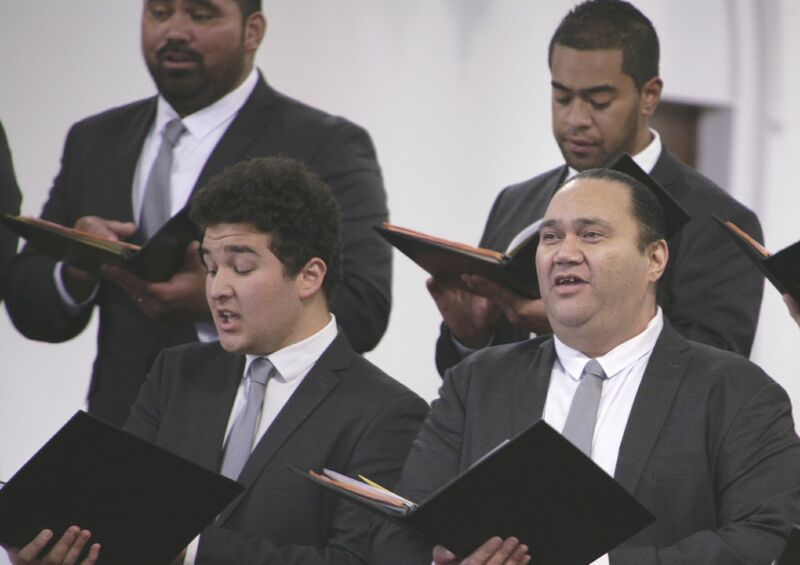 This high profile event was an opportunity for The Graduate Choir NZ to perform in a new venue to a new audience of around 1000.